The Siren Depths is the third volume in The Books of the Raksura by Martha Wells, whose work has been nominated for the Nebula Award. This science fiction/fantasy series has become one of my favorite recent book discoveries, both for its original setting of the Three Worlds and its endearing characters. For this reason, I was glad to hear that Martha Wells will be writing four novellas set in the same world that will be published as ebooks. At least the first two will feature the same characters as the novels. The paperback version of the book was available before the official release date on December 4, but the ebook was not. Now that the official release date has passed, the ebook version of The Siren Depths is also available. In The Cloud Roads, Moon was finally reunited with fellow Raksura after spending years wondering about what exactly he was. He found a home with Indigo Cloud as Jade’s consort, and the entire court had to move to a new home in The Serpent Sea. When they discovered the seed had been stolen from the mountain-tree they were now living in, Moon and the others had to recover the seed—or the heartwood in the tree would die, leaving them homeless once again. Now that the seed is back where it belongs, Moon and the other Raksura of Indigo Cloud are settling into life in their new home and looking toward solving the problem of their low numbers. Moon and Jade are trying to start a clutch, and Jade and Pearl are trying to decide if the time is right for the rest of the Aeriat to start new clutches. In the meantime, Moon’s quick thinking in response to some challenges Indigo Cloud encounters garners him some newfound respect, and he seems to finally be starting to become accepted as a member of the court. One day, some visitors from Emerald Twilight arrive, but the queens of Indigo Cloud refuse to discuss the reason for their visit when asked. The Emerald Twilight Raksura return later, and then Moon learns what happened: their queen Ice suspected she knew Moon’s court of origin when she met him and contacted the Raksura of this court to see if they had lost him. They had, and they also had a rather unexpected reaction to discovering their missing consort was alive—demanding Moon be returned to them. Indigo Cloud feels that it has no choice but to comply with this other court’s wishes, although Jade insists she will follow and will get permission from Moon’s family to keep her consort. Yet Moon arrives to learn there are more problems than just dealing with his newfound family—they have a secret from the past involving the Fell and an augury has shown that they will learn more about it when the Fell soon return. The Books of the Raksura are well-told stories set in a wonderfully imaginative world featuring some compelling characters. 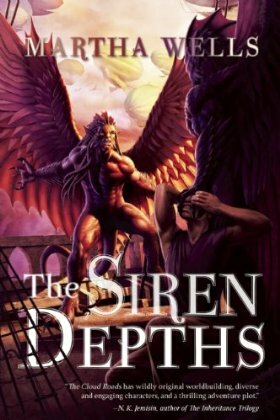 The Siren Depths shares the same strengths as the first two books, but it is one of those books that is richer for having read them. It is my favorite of the three, partially because I’ve grown attached to the various characters and the world over the course of the series and reading a new story about them was a treat. Another big reason I loved this one so much is that it addresses some of the unanswered questions in the series concerning Moon’s backstory and the Fell plan to cross-breed with Raksura. The Siren Depths was an engaging book from start to finish, and I think the focus on these previously unresolved mysteries made it especially absorbing, memorable, and satisfying. The theme of finding a place to belong is a strong one in this series, and I love how it was still important in this volume without feeling like it was retreading the same old ground covered in the previous books. At the beginning of the book, Moon proves himself to be worthy of respect on a couple of occasions and many of the Raksura of Indigo Cloud begin to rely on him. Yet, just as Moon seems on the road to acceptance in his new life, he’s ripped away from his new family and left with a lot of doubts about his relationship with Jade. After all, Jade hid the truth about the reason for Emerald Twilight’s visit from him until she had no choice, and she’s been given a new consort as an apology from Emerald Twilight. As far as Moon’s concerned, it seems as though he’s been replaced, and he has doubts about whether or not Jade means it when she says she’s not willing to let him go, especially since Moon has been cast aside so many times before. It’s heartbreaking to see him forced to leave Jade and his friends behind to face the family he never knew—a family he feels abandoned him or surely they would have found him all those years ago. His longing for a place to belong is such a sympathetic situation, and I really loved both meeting his new family and seeing how Indigo Cloud dealt with the situation. This series is simply written on the surface, but there is a lot going on underneath. The different races and cultures are very well-done and fascinating to read about. I also appreciate how it manages to show all kinds of different relationships with the main character instead of falling into the trap of mainly focusing on the one with the love interest. In this book Moon struggles with how much he can trust Jade, but theirs is not the only important bond. Moon also has complications with his new relatives and close friendships like the one he shares with Chime. My favorite relationship is the one between Moon and Stone, the ancient line-grandfather who found Moon and has become a friend, mentor, and somewhat of a father figure to him. Moon is also a caregiver, teacher, and friend to the orphans he found in The Cloud Roads. I love that Moon has all kinds of different types of relationships and how much more true to life the books are for details like that even though the world is so unlike our own. One aspect of this series I’ve found particularly intriguing is how the Raksura are born into their roles. Raksura with certain characteristics have specific niches, such as warriors, queens, consorts, or mentors. It’s all very neat for most Raksura (the big exception is Chime, who has had to adjust from changing from a mentor to a warrior when that was what Indigo Cloud needed more). However, Moon challenges the conventions attached to a consort. Consorts around Moon’s age are typically shy and sheltered so he is completely different from the norm due to living as a solitary for so many years. In this book, I found it particularly interesting that Moon seemed to be a better warrior than those born warriors since he had more first-hand experience that came from surviving on his own for so long. The warriors would just rush in for the kill, while Moon would actually analyze the situation and think about the best way to approach it. It makes me wonder if some of these roles should not be so neatly assigned, and I like that there are parts like this that provide something to think about. The one thing that bothered me about The Siren Depths is the same major problem I had with The Cloud Roads—the Fell seemed very evil, making them seem less like people than the Raksura did. I’m not completely sure it’s fair of me to feel this way since this world is not composed of humans, but a big reason it doesn’t quite gel with me is that the Raksura and Fell are related. The Raksura all have different personalities and a wide range of characteristics, yet the Fell always seem very black-hearted as a whole. I would have liked to have seen them have more depth, especially considering their common origin with the Raksura, which made it seem a bit odd to me that one of them seemed to be characterized as pretty thoroughly rotten. There are certain elements in this book that make me believe it’s possible the nature of the Fell is due to culture and upbringing rather than being an innate personality trait, but I’d still be curious to learn more about why the the Fell all seem to exhibit similar behavior or if there are any exceptions. All in all, that’s a minor complaint in what still succeeds as a very enjoyable novel, though. The Siren Depths has more of what I’ve come to love about the Books of the Raksura—a compelling story, great world-building in a unique setting, and lovable characters with very realistic problems. In my opinion, it’s also the most satisfying installment in the series because it does provide some answers to questions set up in the first two books and remains absorbing from start to finish. It’s a wonderful addition to an imaginative series that I only love more with each new installment.